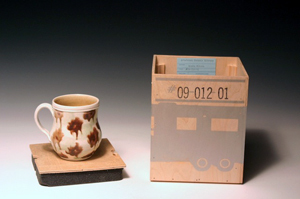 Artstream Nomadic Gallery has been putting contemporary studio pottery on the street for 16 years. Based in Carbondale, CO, Artstream is a traveling exhibition space housed in a restored 1967 Airstream trailer. Since its debut tour, “North American Dishmakers”, in 2002, Artstream has exhibited work by more than 150 national, international, and emerging ceramic artists. It has made stops in over 100 locations across the country from New York City to Los Angeles, Houston to Minneapolis. Artstream works to educated and to place contemporary studio pottery into the hands and homes of the public. Utah State University, Logan UT. Workshops/Symposium by Doug Browe, Mike Helke and Lorna Meaden. Artstream gallery open. Full information coming soon. . .
NCECA Preconference. Many workshop presentations, including 19th and 20th featuring two days of demonstrations by Doug Browe, Mike Helke and Lorna Meaden. April 1 & 2: 10am-5pm Simultaneous demonstrations by Ben Carter, Doug Browe, and Julia Galloway. 9:00am-5:00pm Artstream open, Grove House and Clock Tower. 9am-12:30pm and 1:30-4pm Pitzer Ceramic Studio, Pitzer College, Workshop demonstrations by Doug Browe, Ben Carter, Julia Galloway and Alleghany Meadows.